he Golden Amber Disk Necklace was originally called the Solar Ambrosia Necklace because the gold work around the central pendant is styled on a solar motif. When you look closely, you may be able to see that the Amber center piece has a prehistoric insect preserved with in it. 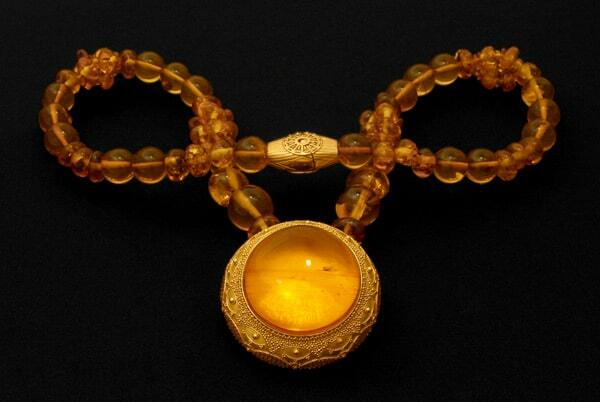 It took 337hours to hand craft out of 22k Gold and assorted Baltic Amber Beads. In a symbolic sense, this fine art jewelry necklace is representative of the sun’s power to enlighten, sustain and nurture life with the warmth conveyed through sparkling golden rays. You see amber is imbued with and embodies this solar essence because it was once the living resin of long lost trees. Amber turns into a translucent sanctuary and preserves for hundreds of millions of years, the spirit of the Sun, wind and rain that once vivified ancient forests. Amber may not appear very often in fine art jewelry like the Amber Disk Necklace. However, it’s use in jewelry has an extremely long legacy. According to a leading ‘amberaologist’, David Grimaldi, the earliest amber beads were discovered in Southern England, in an ancient cavern called Gough’s cave. The age of these beads is dated somewhere between 11,000 and 9,000 years B.C. Keep in mind that we’re talking about prehistoric man at around the end of the last ice age. Do you think that the cave man image of a club bearing brute, only interested in food and shelter makes sense when you’re considering someone who valued and worked with something as ornate and inedible as amber? This chorus echoes with truths hallowed by time. It refers to the starry cosmos, where the waters of the Eridanus/milky way flow. The people of the distant past envisioned the sky as an upturned bowl covering the earth that was filled with liquors of the gods. In legend, heroes sometimes partook of these divine beverages served in rich vessels, gaining untold strength and endless life. So when you wear fine art jewelry like the Golden Amber Necklace, it’s like carrying a solar torch through the annals of time.